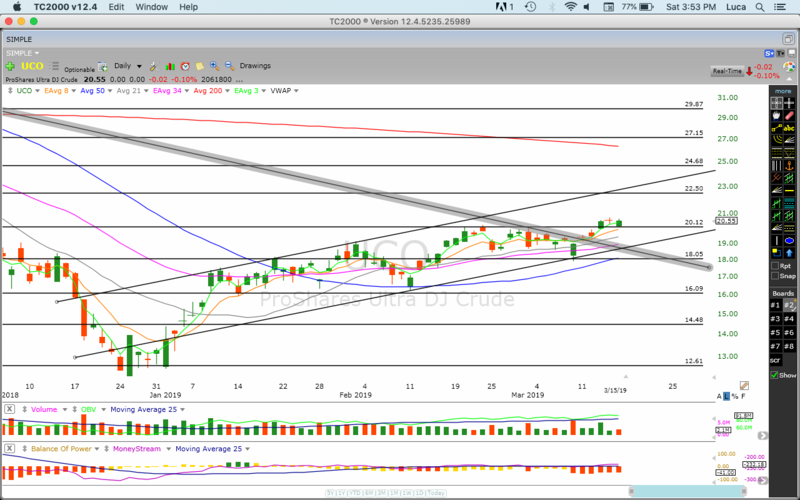 Sharper Trades | What's Up with Crude Oil: Bullish or Bearish? 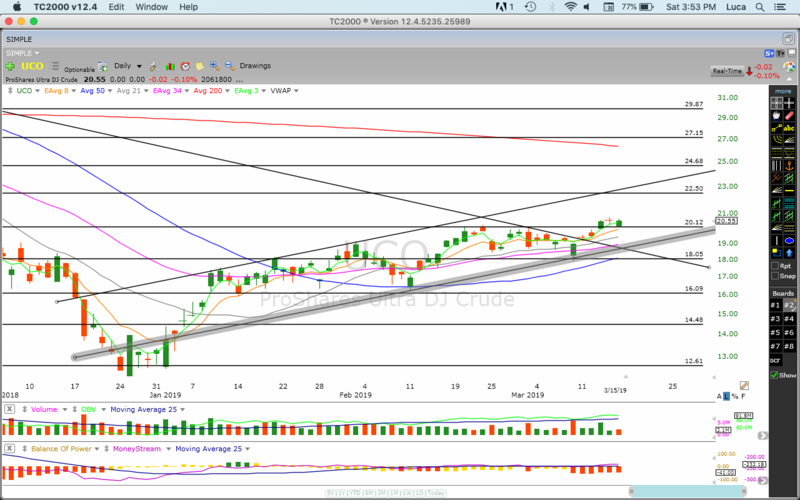 What's Up with Crude Oil: Bullish or Bearish? Q. "Is the price of Brent Crude oil going up or down?" We got asked by one of our students. Here is our answer. A. I don't have a chart that shows Brent Crude oil. The closest equity to that is UCO and that's the one I will be analyzing. Oil found a base at the end of January and from that point on it started moving up. Unless something major occurs that disrupt oil production/demand, this trend will most likely continue. Price recently broke above a resistance trend line (Image 1) and 20.12. It is currently trending inside a rising channel. Here are the things to watch moving forward. If support area @ 20.12 continues to hold, price will try to test upper resistances at 22.50 and channel top (Image 2). 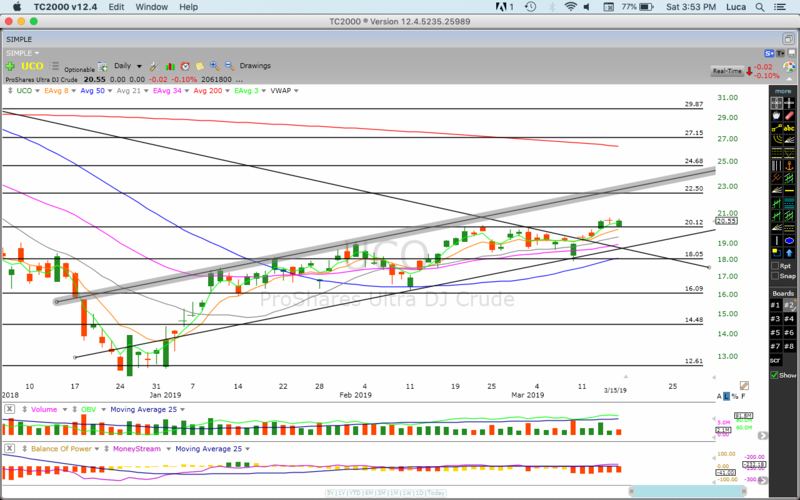 If it breaks above the channel top, it will run to test 24.68, 200 SMA (red line) and 27.15. If resistance holds, price will pull back and retest 20.12 support area, 34 EMA (purple line) and channel bottom (Image 3). If the channel bottom fails to hold, price will drop lower to test 18.05 and 50 SMA (blue line). A break below 18.00, will bring price back into bearish territory and a possible retest of lower supports at 16.09 and 14.48. All the information shared in this video is provided for educational purposes only. Any trades placed upon reliance of SharperTrades.com are taken at your own risk for your own account. Past performance is no guarantee. While there is great potential for reward trading stocks, commodities, options and forex, there is also substantial risk of loss. All trading operations involve high risks of losing your entire investment. You must therefore decide your own suitability to trade. Trading results can never be guaranteed. This is not an offer to buy or sell stock, forex, futures, options, commodity interests or any other trading security.